Imagine going out without the hassle of layering up high street items that are either sleeveless, have scooped necklines or both! With the days getting warmer, wearing endless layers is the last thing a girl wants when she goes out. A shirt dress is a must have item in your wardrobe for the Spring/Summer season. It's chic style is enough to flatter any figure and best of all, it's the ideal answer to easy one-piece dressing. 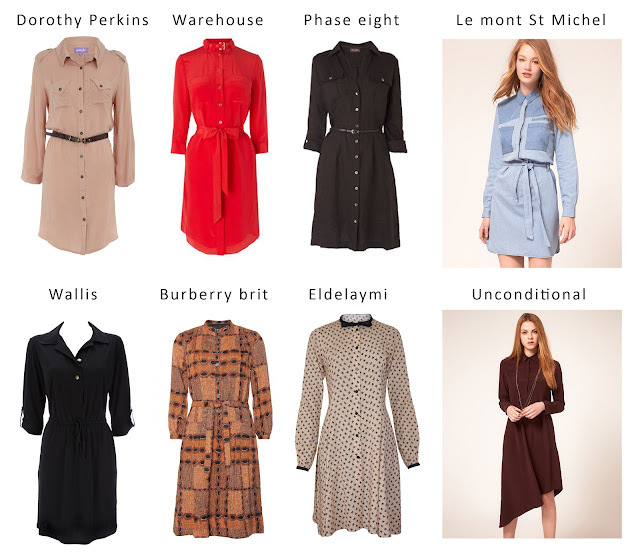 I've selected a few of my favourite shirt dresses for the season from high street to high end, hope there's something here for everyone! Stone belted shirt dress £12﻿, Dorothy Perkins; Buckle neck silk shirt dress £35, Warehouse; Linen shirt dress £69, Phase Eight; Le Mont St Michel 2 tone denim shirt dress £155, ASOS; Black jersey shirt dress £38, Wallis; Burberry Brit ethnic print shirt dress £350, mytheresa; ELDELAYMI bow print shirt dress £30, ASOS; Unconditional assymetric shirt dress £209, ASOS. The Le mont St Michel! They look like you can roll the sleeves down to make them full length. I really like the red dress from Warehouse. The dresses usually wear with black leggins or bare leg, I wonder how it goes with a pair of trouser or jeans. Does that look okay?